Experts around the world have accepted the fact that steel is the perfect metal for the construction material used in any building. The beautiful houses and elegant offices surrounding us from all the sides are supported by the sturdy sections made out of structural steel. Both private and public infrastructure rest primarily on the steel as it has some wonderful inherent features, such as tensile strength, durability, versatility, etc. 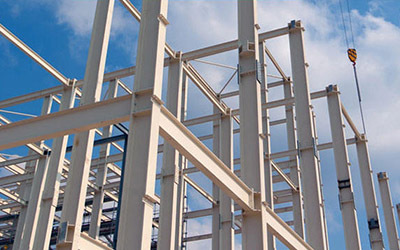 We produce structural steel of superior quality in the I-beam, bar, channel, angle, flat, plate, tee, and HSS shapes for a variety of applications, such as homes, schools, shopping malls, oil & gas plants, bridges, airports, and so on. We employ latest fabrication processes which consume less time and are guaranteed to match the specifications of our clients. Our tradesmen conduct the on-site inspection to check whether the shape and quantity of the structural steel requested by you suits your plan or not. We deliver the structural steel to your site using our vehicles and our riggers & fitters assemble it accurately by taking all safety precautions. From carports to high-rise hotels and from pressure pipes to transmission tower, we have excelled in drafting, manufacturing and installing structural steel for every place and use. Along with the framework of structures and various other applications, steel is also the favourite material for the products used in enhancing the architectural appeal of any place. We fabricate and install roof screens, balconies, balustrades, railings, staircases, decks, fences, gates, doors, sheds, swimming pool walls, etc. in residential, commercial, and industrial spaces. Our team visits the site and understands your needs. We have a wide array of patterns and styles to suit the varied tastes, preferences, and budgets of our customers.